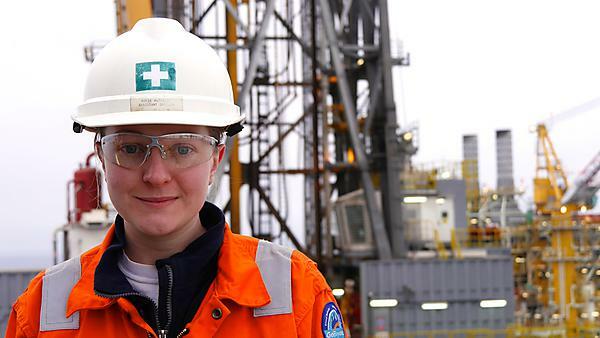 Straight after my degree I started working on offshore drilling rigs around the world as a mud logger, working from Greenland to Africa, collecting and analysing samples of the rock being drilled. I quickly realised that mud logging wasn’t for me and I wanted something a bit more challenging and exciting so sought a career as drill crew, who are a small core team of approximately seven people who run the drill floor and drill for the oil. I have now made my way up from roustabout to assistant driller and it was the best decision I ever made! Working offshore can be very challenging both physically and mentally, we work 12 hours a day for 21 days straight with the same small team of people. Adapting to this unique environment has been the most difficult thing I have faced. Every day is different and there are always new and exciting things to do, from the helicopter flight to the rig on your first ever trip to operating machinery that moves something weighing thousands of tons. The most fun was working as a roughneck on a conventional rig, running drill pipe into the hole which is a fast paced, involved, physical task. It is a very competitive industry to get into and mud logging is an easier route in, although it is very unusual to move from logging to drill crew so be persistent and show that you really want it. Studying at Plymouth gave me an excellent grounding and it was through Sally, our school secretary, that I was able to apply for the mud logging job. All of the field trips were also amazing and I got to visit fantastic places like Spain, Iceland, and Death Valley. I would highly recommend studying at Plymouth, especially geosciences; there is a great relationship between staff and students, the field trips are awesome and Plymouth is a great city to be in. For more information visit our BSc (Hons) Physical Geography and Geology course page. For more information on our range of geography and geology courses within the School of Geography, Earth and Environmental Sciences, please visit the school page.